This dish is like a normal risotto but with a fuller, nuttier flavour as I use oat groats instead of rice. If you don’t cook with oat groats already then it is time to try it out! Groats are the hulled kernel of the grain which is rich in fibre and protein. It will keep you fuller for a longer time, has less carbs than rice and is also, supposedly, helpful against high cholesterol. But first and foremost, it has lots of wonderful flavour! • Sauté the mushrooms over medium heat until all liquid has evaporated. Add the onion and sauté until soft. Stir in the sundried tomatoes and the spinach during the last few minutes. • Boil the oat groats in bullion over medium heat (this has a tendency to overflow while boiling so keep a close watch) until done (15-45 minutes, please see the manufacturers recommendation – some will tell you to soak the groats before cooking). 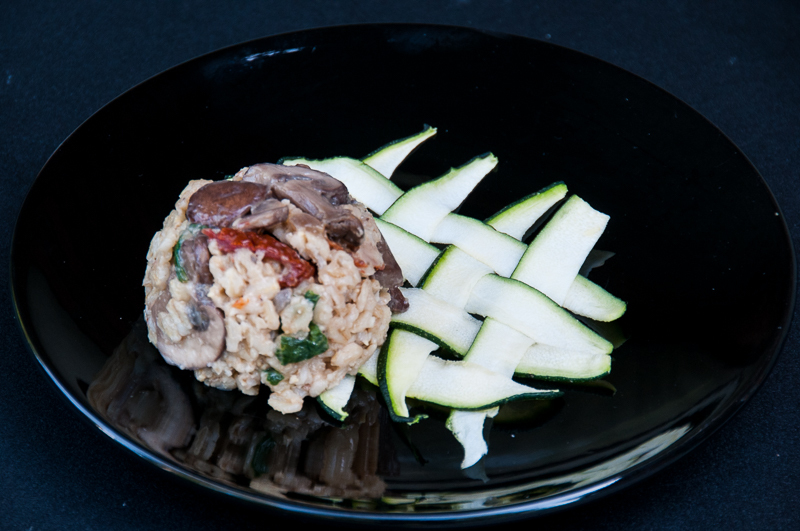 • Add the mushroom mix into the ready oats. • Take off heat and stir the Parmesan cheese (or feta cheese) into the mix. Serve with a fresh salad or, as I’ve done here, on a braided Zucchini/Courgette mat. A wholesome casserole, full of flavor. Serve with gluten free pasta, rice, marinated zucchini noodles (see recipe below) and/or the Parmesan Muffins I posted a few weeks ago. 2. Sautee the carrots, shallots and celery. When done, add the garlic and sauté for another minute. 3. Add the tomatoes, bay leaves, lemon juice, balsamic vinegar, spices and let simmer for 15 minutes. 4. Add the chicken and simmer another 10 minutes, or, until the chicken is done. 5. Add the ham and simmer 2-3 minutes. 6. Sprinkle some oregano on top. These noodles are quick and easy to make and simply delicious. 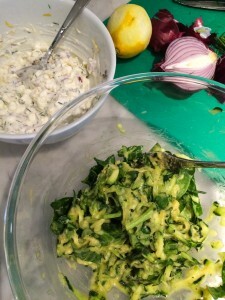 I like to marinate them a little more than 30 minutes – this way the zucchini has time to soften and the flavor of the marinade penetrate the dish. 2. 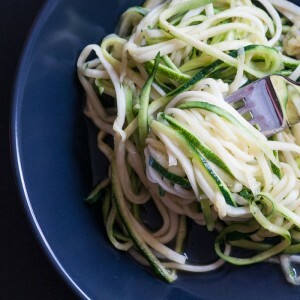 Using a spiralizer, create the noodle like threads of the zucchini. 3. Pour the marinade over the zucchini and let stand for +30 minutes. A wonderful, asian inspired salmon recipe. To cut the vegetables into strands, please use a Spiral Slicer (Spiralizer). Place all the ingredients for the salmon marinade in a blender and mix until a smooth paste. Place the salmon in individually tin foil parcels, spoon over the marinade. Close the parcels and place in the oven for about 20-25 minutes. Cut the cucumber into 3-4 pieces (the fewer the better). Remove the seeds with the tool used to remove an apple’s core. With a sharp knife, start carving a long, thin, spiral. Arrange the spiral cucumber on the serving plate. The longer spiral the more beautiful. Set aside. Prepare the wok vegetables. Heat the oil in a wok pan (or large frying pan). Add all the wok vegetables and fry a few minutes over high heat, constantly (gently) stirring. Season. In a small saucepan, heat some oil and sauté the ginger. Add the remaining ingredients for the red sauce except the corn flour. Let simmer a few minutes. Dissolve the cornstarch in a little water and add to the sauce while stirring. Bring to a boil and keep stirring while simmering for a few minutes. Remove from heat. 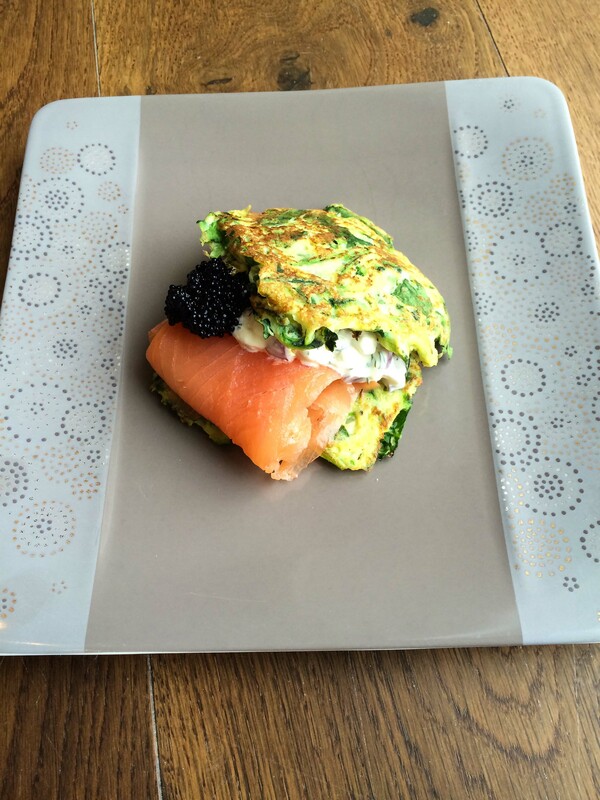 Place on plates, leave salmon in parcel or take out, as you desire. Add the wok vegetables, cucumber spirals and red sauce. Sprinkle some coriander on top. A delicious starter stuffed with your favourite filling. 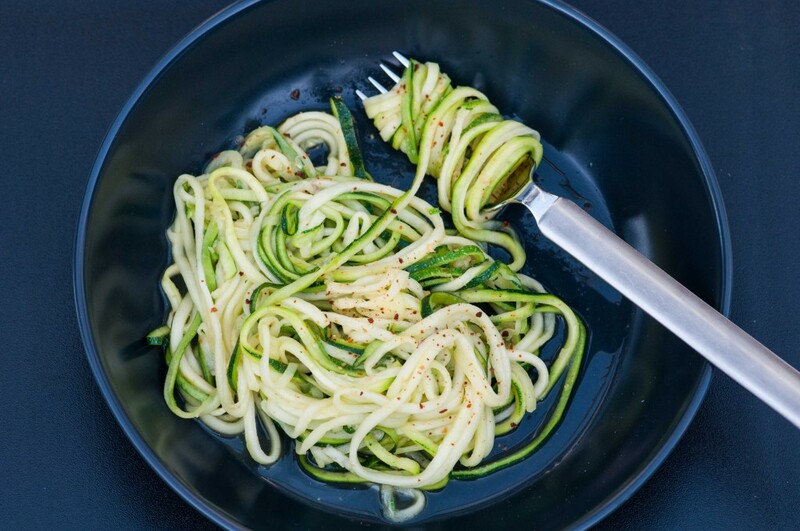 Marinate the courgette slices in the lemon juice for at least 30 minutes and season with salt and pepper. Combine the ingredients for the 3 stuffings in separate bowls. 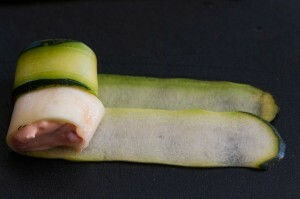 Arrange 2 courgette slices lengthwise, overlapping a little bit on the long side., creating a wider courgette slice. Place a spoonful of stuffing at one end and roll up tightly. Place standing up on a serving plate. Make 2 more rolls with the other stuffings. Decorate the plate with the walnuts and peppers and serve. 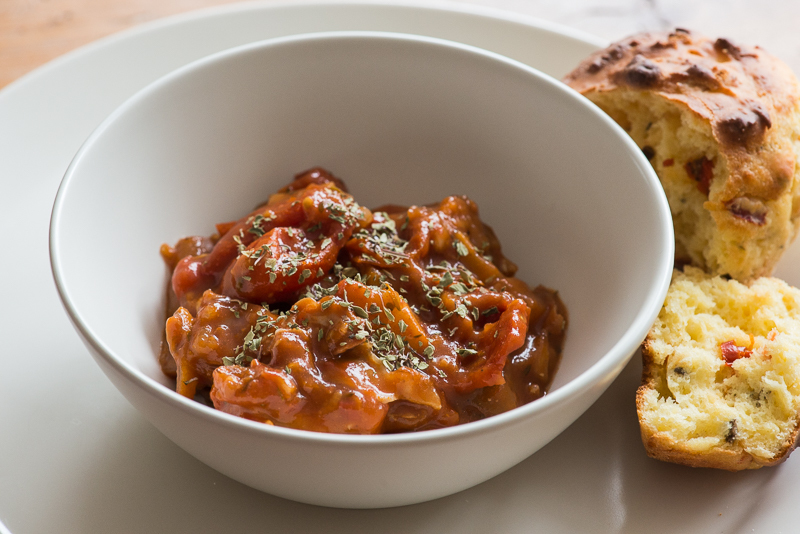 For a festive Sunday brunch, serve with Gluten Free Crisp Bread with Dips! After an overindulging weekend, I like to cook something healthy, yet elegant, for a Sunday brunch with friends. 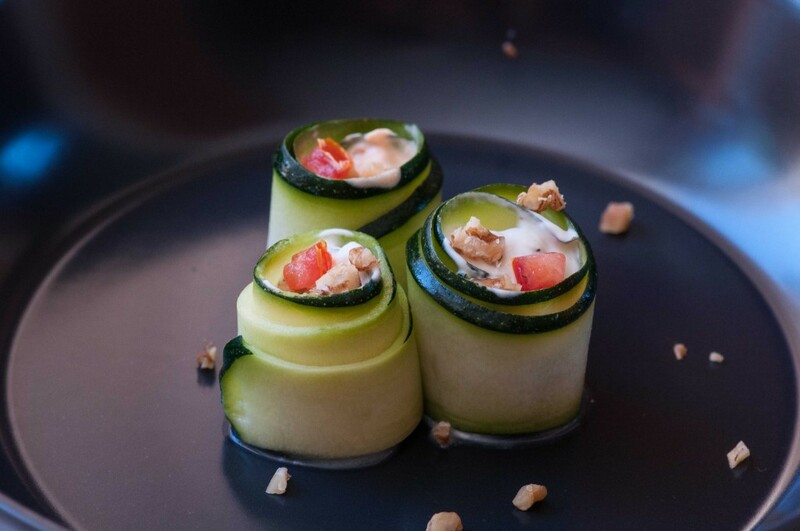 These Zucchini Blinis offer a lighter option than the rich buckwheat version. 1. Mix soy flour and egg to a smooth batter. 2. 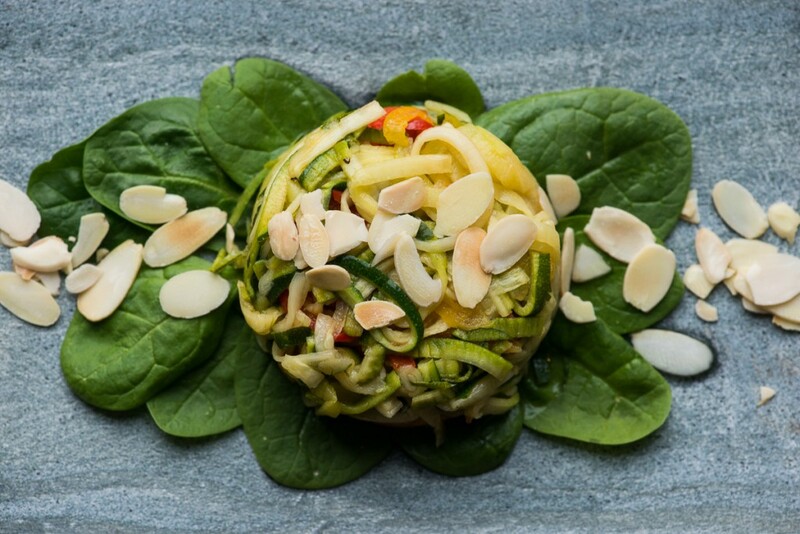 Squeeze the water out of the grated zucchini, add spinach and combine with the egg batter. 3. 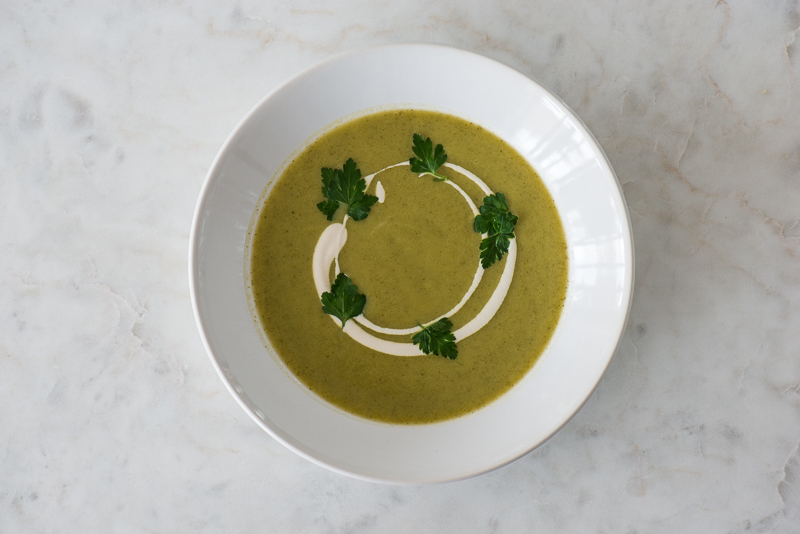 In a bowl, mix together all ingredients for the cottage cheese sauce and set aside. 4. Pan fry the zucchini blinis on medium heat in a little olive oil (or butter if you prefer). Use a spoon and gently flatten each blini to form a small round cake with a diameter of about 9 cm (3,5 inches) each. About 2-3 tbsp of batter is about right for each blini. Let it brown for 2-3 minutes on each side. Make 8 blinis. 5. Place one blini on each plate, add rolled up salmon, a dollop of the sauce, a tsp of caviar and cover with a second blini.